Posted on Thursday, February 10th, 2011 at 2:48 pm. In one sense the answer to the question posed in the panel’s title is clear. The responsive city is a fiction. It doesn’t exist, and it may not ever exist, except in our imagination. Thank you for coming. But seriously, whether it is fact or fiction, of course, begs the question of what is a responsive city. I am certain this panel will shed some light on these questions today. I am neither a practitioner nor a theorist, but the ideas of the responsive city have animated my curatorial practice at least since 2004, when I proposed the 13th ISEA Symposium – which was held in 2006 in San Jose – have as one of its themes the “Interactive City.” Working with Eric Paulos and a stellar steering committee of artists and thinkers, we acknowledged the slipperiness of the thematic in its call for projects relating to the following topics: Shadow City, Collaborative Challenge, Hybrid Histories, Non-Places, Alternate Playgrounds, Urban Archaeology, Exposed City, Open Traversal, Operational City, Hacked City, Parasitic City, Open Source City, Alternate Economies, Town Hall, Community Mapping, and Parallel Cities. For every 01SJ Biennial since and for many projects in between, I have worked with a wide range of artists and architects, whose projects are what Julian Bleecker has referred to as “design fictions” for the responsive – or in Mark’s more felicitous phrasing, sentient – city. So, without further ado, I will briefly introduce each panelist, who will then speak for about 18 minutes, followed by a response from Mark Shepard, after which there may be time for some questions from the audience – or perhaps fisticuffs on the panel. That would be exciting. Ben Rubin is a media artist based in New York City. Rubin’s work is in the collections of the Art Institute of Chicago, the San Jose Museum of Art, and the Science Museum, London, and has been shown at the Whitney Museum in New York, the Reina Sofia Museum in Madrid, the Fondation Cartier pour l’art contemporain in Paris, and the ZKM Center for Art and Media in Karlsruhe. Rubin has created large-scale public artworks for the New York Times, the city of San Jose, and the Minneapolis Public Library. I consider Ben’s Listening Post, with Mark Hansen, to be one of the most significant works of art, in any medium, of the 21st century, and I think it is remarkable that its cousin, Moveable Type, is on permanent, changing display at the New York Times building just down the road. Ben also has a show at Bryce Wolkowitz gallery, which you should see before you leave town, if you haven’t. Barbara Goldstein is the Public Art Director for the City of San Jose Office of Cultural Affairs and the editor of Public Art by the Book, a primer recently published by Americans for the Arts and the University of Washington Press. Prior to her work in San Jose, Goldstein was Public Art Director for the City of Seattle. Goldstein has worked as a cultural planner, architectural and art critic, editor and publisher. She has written for art and architectural magazines and lectured on public art both nationally and internationally. She is currently Chair of the Public Art Network for Americans for the Arts. Barbara has been a colleague and collaborator for each of the 01SJ Biennials, and the public art master plan [pdf] she instigated for public art at the San Jose Airport is, for me, is a model or at least pointer to how to think about creating the “rules” to enable an engaging responsive city to emerge. Cameron McNall is an Architect and Principal of the group Electroland. Every Electroland project is site-specific and may employ a broad range of media, including light, sound, images, motion, architecture, interactivity, and information design. Electroland works at the forefront of new technologies to create interactive experiences where visitors can interact with buildings, spaces and each other in new and exciting ways. A pop sensibility, expressed through whimsy and play, helps Electroland to achieve projects that are accessible and that invite visitor participation. I have not had the pleasure of working, yet, with Cameron, but at least he now returns most of my emails, and I have always admired the range of Electroland’s work from shadow billboards to frenetic facades and the layered complexity behind each project. Mark Shepard is an artist, architect and researcher whose post-disciplinary practice addresses new social spaces and signifying structures of contemporary network culture. His current research investigates the implications of mobile and pervasive media, communication and information technologies for architecture and urbanism. Recent works include the Sentient City Survival Kit, a collection of artifacts for survival in the near-future sentient city; and the Tactical Sound Garden [TSG] – which he did present at the aforementioned ISEA/01SJ Biennnial in San Jose – an open source software platform for cultivating virtual sound gardens in urban public space. In 2009, he curated “Toward the Sentient City,” an exhibition of commissioned projects that critically explored the evolving relationship between ubiquitous computing and the city. He is the editor of Sentient City: ubiquitous computing, architecture and the future of urban space, published by the Architectural League of New York and MIT Press. Mark’s writing and programming as well as his art have all been important influences on my own thinking and practice. There will be a book launch event tomorrow evening at McNally Jackson books, and I think it’s worth noting in the context of this panel that the book, Sentient City will also feature a special “heat sensitive” cover which will change color when exposed to sunlight or touch! The Responsive City – Fact or Fiction? Posted on Tuesday, January 25th, 2011 at 11:06 pm. This panel will examine the experience of artists and presenters with large-scale, long-term interactive art in the public sphere and the pragmatic, conceptual and philosophical issues such projects engender. There is a significant history of festival and exhibition-based public programming of interactive works but long-term and permanent installations are less common. The possibilities for large-scale, interactive art in the public sphere are increasing exponentially, however, and this panel will consist of at least two artists and a presenter, who will discuss their projects in relation to the pragmatics of production and the histories of public and new media art practices, as well as the intersection with civic and economic imperatives embodied in the notion of the creative city. A respondent will critique these projects in relation to issues of agency, free speech and spectacle. Barbara Goldstein will trace the evolution of interactive cities from early utopian concepts, comic books and Archigram’s “Plug In City” through the manifestation of interactivity in contemporary urban form and the unique role that technology-based art has played in the activation of space and place. Barbara Goldstein is the Public Art Director for the City of San José Office of Cultural Affairs and the editor of Public Art by the Book, a primer recently published by Americans for the Arts and the University of Washington Press. Prior to her work in San José, Goldstein was Public Art Director for the City of Seattle. Goldstein has worked as a cultural planner, architectural and art critic, editor and publisher. From 1989 to 1993, she was Director of Design Review and Cultural Planning for the Los Angeles Department of Cultural Affairs. From 1980-85 she edited and published Arts + Architecture magazine. She has written for art and architectural magazines both nationally and internationally, and has lectured on public art throughout the United States, and in Canada, Japan, China, Taipei, Korea and Abu Dhabi. She is currently Chair of the Public Art Network for Americans for the Arts. Ben Rubin presents his public illumination projects and discusses the ways changing light technology has altered the fabric of urban life for more than two centuries. With the explosion of LED and other dynamic (and potentially interactive) lighting technologies on city skylines, what is the future of night in the city? Ben Rubin (b. 1964, Boston, Massachusetts) is a media artist based in New York City. Rubin’s work is in the collections of the Art Institute of Chicago, the San Jose Museum of Art, and the Science Museum, London, and has been shown at the Whitney Museum in New York, the Reina Sofia Museum in Madrid, the Fondation Cartier pour l’art contemporain in Paris, and the ZKM Center for Art and Media in Karlsruhe. Rubin has created large-scale public artworks for the New York Times, the city of San José, and the Minneapolis Public Library. He is currently developing a site-specific sculpture called Shakespeare Machine for the Public Theater in New York, and just completed Beacon (2010), a luminous rooftop sculpture commissioned for National Museum of American Jewish History in Philadelphia. Mark Shepard is an artist, architect and researcher whose post-disciplinary practice addresses new social spaces and signifying structures of contemporary network culture. His current research investigates the implications of mobile and pervasive media, communication and information technologies for architecture and urbanism. Recent works include the Sentient City Survival Kit, a collection of artifacts for survival in the near-future sentient city; and the Tactical Sound Garden [TSG], an open source software platform for cultivating virtual sound gardens in urban public space, both of which have been presented at museums, festivals and arts events internationally. 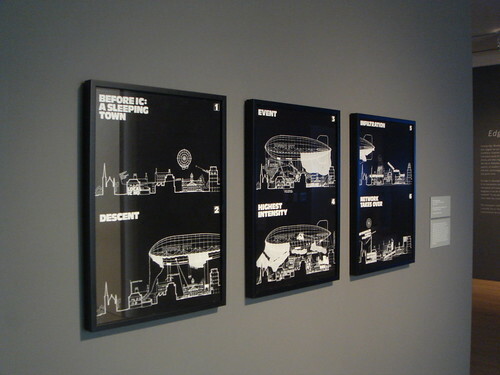 In 2006 he organized Architecture and Situated Technologies (with Omar Khan and Trebor Scholz), a symposium bringing together researchers and practitioners from art, architecture, technology and sociology to explore the emerging role of “situated” technologies in the design and inhabitation of the contemporary city. In 2009, he curated Toward the Sentient City, an exhibition of commissioned projects that critically explored the evolving relationship between ubiquitous computing and the city. He is the editor of Sentient City: ubiquitous computing, architecture and the future of urban space, published by the Architectural League of New York and MIT Press. Sentient City: ubiquitous computing, architecture and the future of urban space. An exhibition critically exploring the evolving relations between ubiquitous computing, architecture and urban space. Organized by the Architectural League of New York in 2009. A series of pamphlet-length publications that examines the implications of contemporary mobile, embedded and responsive systems for architecture and urbanism. Posted on Saturday, April 17th, 2010 at 6:30 am. Art and Architecture in the Public Sphere of Cities. Joshua Decter, director of the Master of Public Art Studies Program at USC, organized and moderated this event exploring art and architecture in the public sphere, and unorthodox ways of engaging the public. The panel featured Anne Pasternak, president and artistic director of Creative Time, New York; Los Angeles based installation artist Doug Aitken; and Peter Zellner, Los Angeles-based architect and founding principal of ZELLNERPLUS. The event was presented as part of Visions and Voices, and was held on February 2, 2009, at the Davidson Conference Center. Public Space, Public Art and Public Life. USC Norman Lear Center director Marty Kaplan moderates this incisive panel discussion that explores the interplay between art and architecture in urban spaces. Panelists: artists Christopher Janney & Anne Bray; USC School of Cinematic Arts’ Scott Fisher; Ted Tanner of AEG Real Estate & LA Live; Fox Music’s Robert Kraft; USC School of Architecture Dean Qingyun Ma. Architecture, Design, Art: Strategies for Survival. USC — April 23, 2009 — “Architecture, Design, Art: Strategies for Survival” was a conversation among Teddy Cruz, Marjetica Potrc and Krzysztof Wodiczko that took place on April 6, 2009. The event was organized and moderated by Joshua Decter, director of the Master of Public Art Studies Program (Art in the Public Sphere) at the USC Roski School of Fine Arts, and was the second part of the “Participation and Friction: Rethinking Art and Architecture as Public Culture” series, sponsored by Visions and Voices: The USC Arts and Humanities Initiative. See also the Roski School of Fine Arts Masters of Public Art Studies Guest Speakers / Lecture Archive for talks by a growing list of speakers, including Doug Aitken, Ute Meta Bauer, Teddy Cruz, Steve Dietz, Mark Dion, Sam Durant, Andrea Fraser, Rudolf Frieling, Hou Hanru, Paul Ramírez Jonas, Grant Kester, Norman Klein, Michael Krichman, Miwon Kwon, Rick Lowe, Daniel Joseph Martinez, Allan McCollum, Anne Pasternak, Patricia Phillips, Marjetica Potrč, Gregory Sholette, Rochelle Steiner, Gloria Sutton, Nato Thompson, Krzysztof Wodiczko, Peter Zellner, and Tirdad Zolghadr. Posted on Monday, December 7th, 2009 at 1:34 am. Looks like a great line up for a panel with a ho-hum title “Confounding Expectations X: Photography in Context The Projected Photograph” at the Vera List Center this Thursday – George Baker, Andrea Geyer, Paul Pfeiffer, and Krzysztof Wodiczko. It’s still faintly amusing to me that a stellar panel like this might coalesce around the medium-specificity of the photographic image, deploying the term “immersive” in relation to cinema without, apparently, a nod to either the communicating projections of, say, Kit Galloway and Sherrie Rabinowitiz’s Hole-in-Space or the dynamic environments of, say, Fashionably Late for the Relationship (installation version) by R. Luke Dubois and LiÃ¡n Amaris. Nevertheless, it is a rich topic. See MHKA’s The Projection Project exhibition with work by Marie JosÃ© Burki, Marc De Blieck, Thierry De Cordier, Rodney Graham, Pierre Huyghe, Kristina Ianatchkova & Vitto Valentinov, TimothÃ©e Ingen-Housz, Yeondoo Jung, AndrÃ© Kruysen,Bertrand Lavier, Bruce Nauman, Stephen & Timothy Quay, Joost Rekveld, Matthew Stokes, Fiona Tan, Krassimir Terziev, Ana Torfs, Paul Van Hoeydonck, Benjamin Verdonck, Cerith Wyn Evans and Thomas Zummer. I contributed a talk “Into the Streets,” which attempted to construct a discernible trajectory from the kind of gallery-based work that Chrissie Illes presented in her mesmerizing 2001 exhibition, Into the Light: The Projected Image in American Art 1964-1977, to contemporary practice, such as Wodiczko’s CECUCT project and the kind of work I am interested in at Northern Lights as well as the 01SJ Biennial. And hopefully, Pfeiffer will at least mention his The Saints project, which remains an animating experience for me and taught me that even in a large-scale, public context, spectacular size is not everything. The visual element of The Saints was physically minor, even though critical to the overall experience.